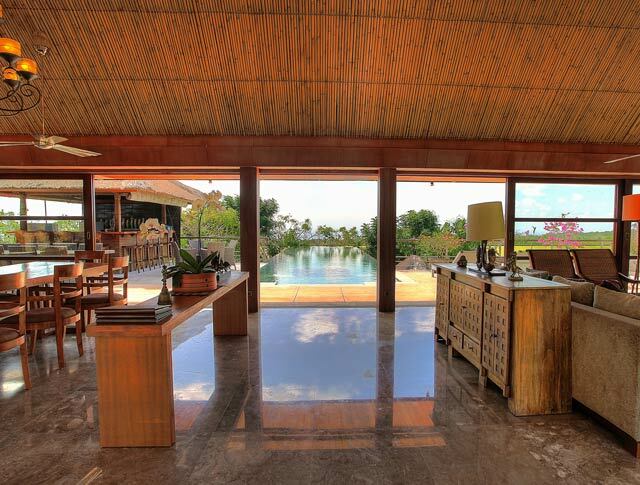 Villa Indah Manis is a glamorous five-bedroom hillside sanctuary on Bali’s Bukit Peninsula, home to many of the island’s best beaches. 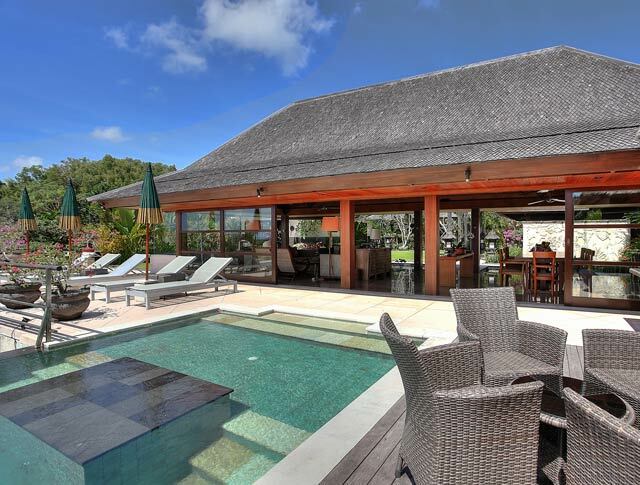 Bordered by a tree-lined valley, and with views of the ocean, the property is a great choice for vacations and celebrations. 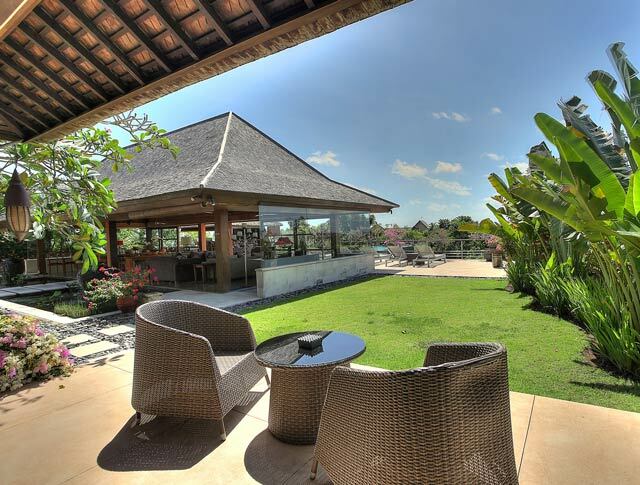 Indah Manis is also well suited for families, presenting five-star service and an abundance of facilities for all ages, including a swimming pool, spa area, fitness room, petanque court, pool table and games room with a home theatre. 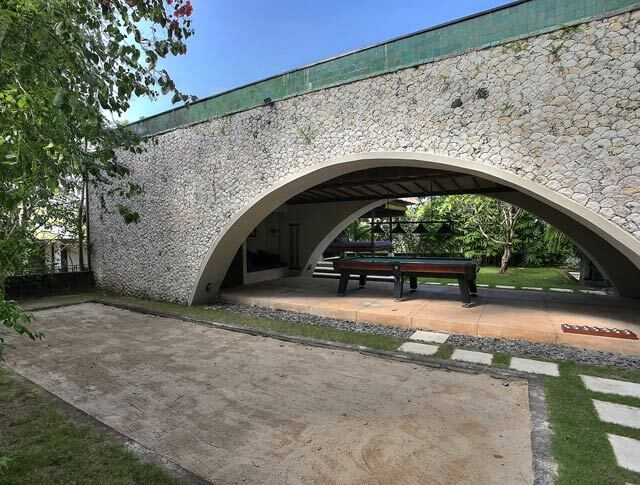 The villa sleeps ten adults and four children, plus two extra adults when rented in conjunction with the adjacent, self-contained Bulan Madu honeymoon villa. 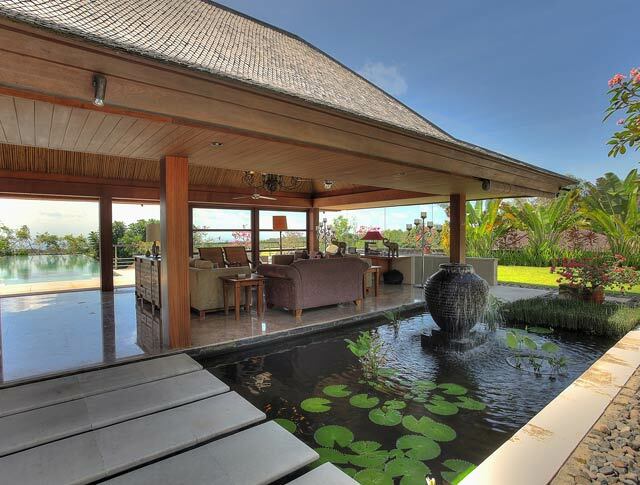 Indah Manis is composed of a series of pavilions complemented by gorgeous flat-lawned gardens and lily ponds. At its heart is a fan-cooled living and dining pavilion, open at the front to a 16-metre infinity pool, sun deck, alfresco dining terrace and bar, and with views to the ocean beyond. 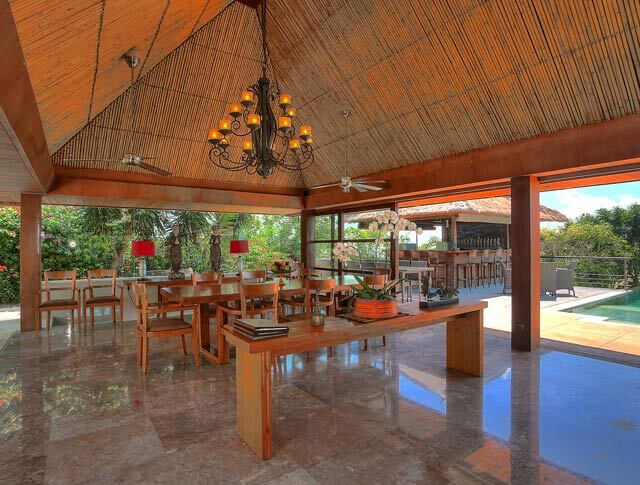 The fully equipped kitchen and the bedroom suites are set further back among the gardens. 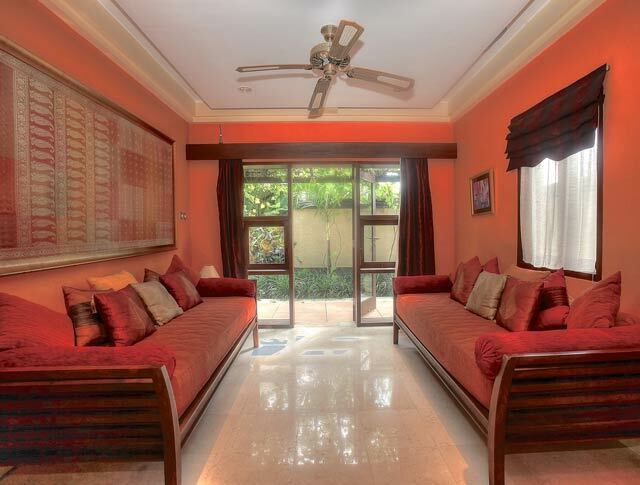 One of the five bedrooms has an annex that can accommodate two extra children. 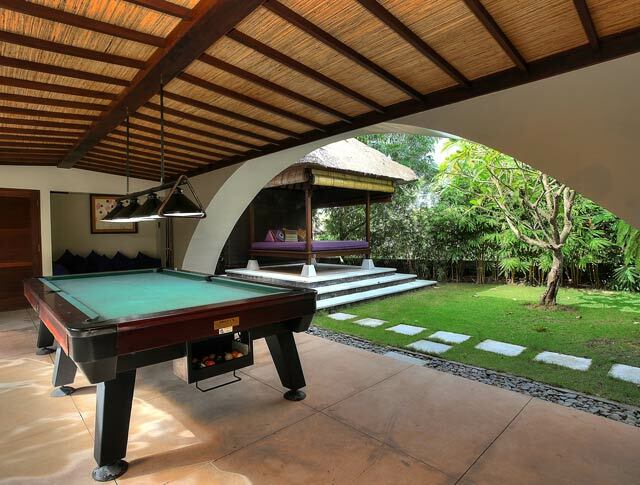 Beneath the pool deck, the lower ground floor comprises an air-conditioned home theatre, fitness room, spa room, the Lotus bedroom and an open-sided games room. 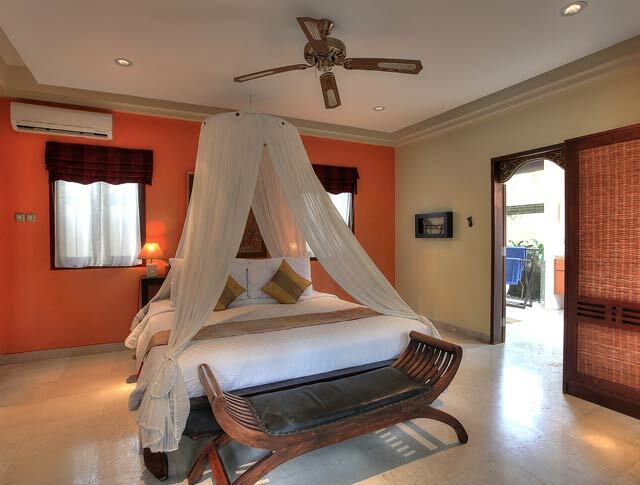 The self-contained, one-bedroom honeymoon villa, Bulan Madu, can be rented in conjunction with Indah Manis to make a private and romantic sixth bedroom. 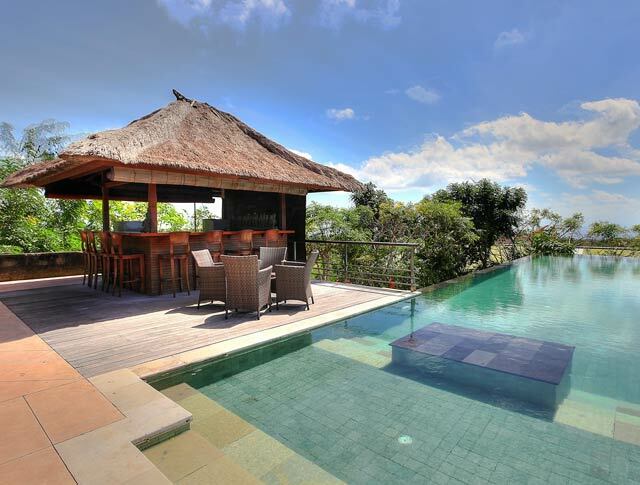 The Kamboja suite, with its royal décor and wide hilltop views, takes pride of place at Indah Manis. This romantic bedroom is named after the fragrant frangipani flower and is distinguished by a royal red entranceway, off which is a bold purple and gold-trimmed bedchamber, a luxurious dressing area and an ensuite bathroom where guests can soak in a petal-filled bathtub under the gaze of a benevolent goddess in a private garden courtyard. Below a soaring roof, the bedroom is furnished with a small desk, a satellite TV and a canopied king-size bed dressed in soft white linen and accessorised with richly embroidered cushions and trim. Making the most of the glorious views, wide sliding glass doors open onto a stone terrace furnished with comfortable all-weather armchairs and a side table. Named after the sweet-scented gardenia flower, the air-conditioned Jempiring room beckons its guests across a lily pond before welcoming them with a chartreuse-green theme and plenty of space. Furnished with twin beds that convert to a queen-sized bed, together with two sofas that can be made up as single beds, this room is perfect for a group of up to four kids or a couple with two young children. 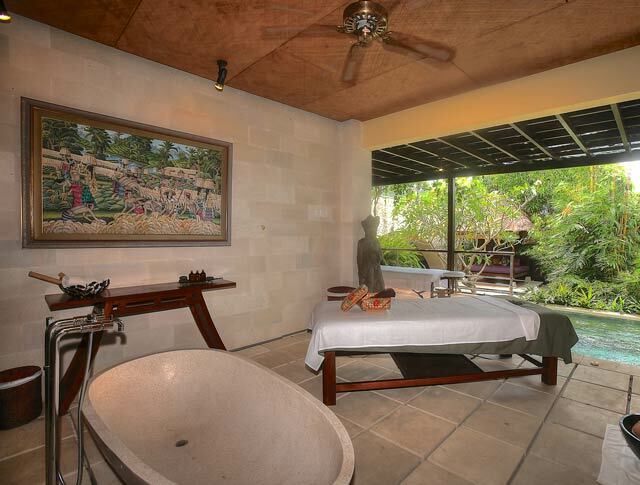 All age groups will love the ensuite garden bathroom, which is fitted with twin washbasins and a rain shower and features a stunningly lit Balinese statue framed within a glassless window. Alamanda is a trumpet-shaped flowering climber, and this bright guest room of the same name, with its king-size bed and cosy annex, is perfect for either a couple looking for a little extra living space or for a family. The orange-toned Melati (jasmine) annex serves a dual purpose as either a private sitting room or as a kids' bedroom, sleeping up to two children on the two sofas, which convert to twins or a double bed. The two rooms share a bathroom. 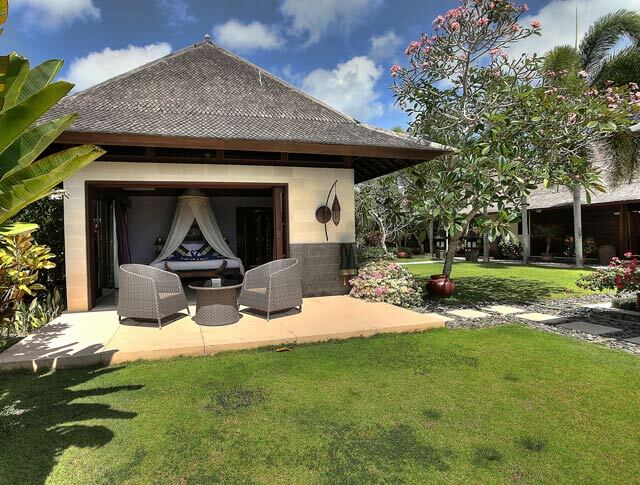 Cempaka (also meaning Frangipani) is the only upstairs suite at the villa, and has extraordinary views from its breezy covered terrace, which is furnished with a comfortable daybed and a gracious wooden statue. In the bedroom, guests will just melt into the ambiance of the rich chocolate-accented décor, packaged in glass, teak, and coffee-coloured marble. 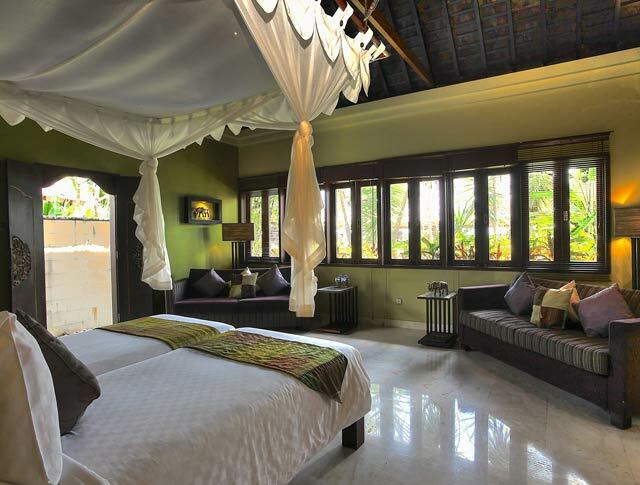 Here, the king-size bed is positioned to enjoy the views through glass doors that open widely onto the terrace. The room is equipped with a satellite TV and has an ensuite bathroom enclosed within slatted timber walls and filtted with a refreshing rain shower. Stairs at the side of the living pavilion lead down to Indah Manis' 'fun zone' where, alongside the spa, fitness and games rooms, lies the Lotus guestroom. 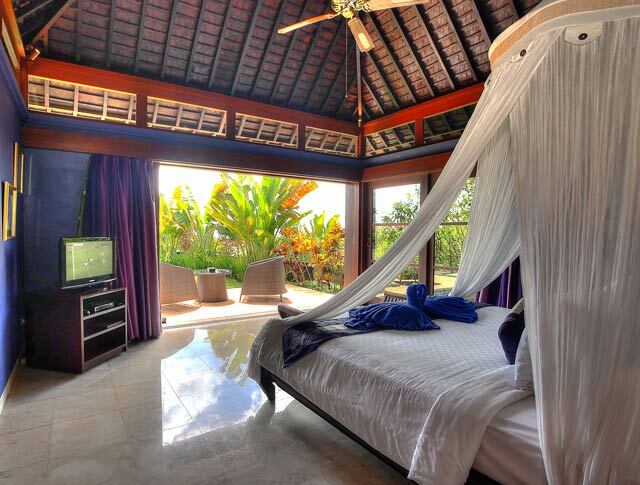 Older kids, in particular, will love having this area of the villa to themselves. With bright yellow and lavender walls, large twin beds, and a wall of glass doors to the front opening onto a furnished terrace complete with a large jacuzzi, the Lotus room makes a wonderful hideaway.